The Sunshine State is a great place for bikers. Beaches, ocean views, sunshine and long, ambling highways are just some of the reasons that Florida is so popular for riding motorcycles. To both residents and visitors to our state, Florida is an ideal place to ride. Unfortunately, perhaps because of our popularity as a biking destination, the state also ranks among the top states for motorcycle accidents. Hundreds of bikers die each year and many more are seriously injured. If you are a biker that was injured in a crash caused by someone else's negligence, please call The Kelleher Firm at 833-546-3675. We have offices in Fort Myers and Naples, and we provide free case reviews 24 hours a day, 7 days a week. Our experienced attorneys can determine whether you have a claim to pursue compensation for your catastrophic injuries. Motorcyclists have a right to be on the road just like any other licensed motorist. They have a right to the highway, and the same caution should be exercised around them as around other motorists. Some of the most common motorcycle accidents can be linked backed to a motorist who overlooks the presence of the motorcycle on the road, or who recklessly and aggressively denies the motorcyclist their right to the road. 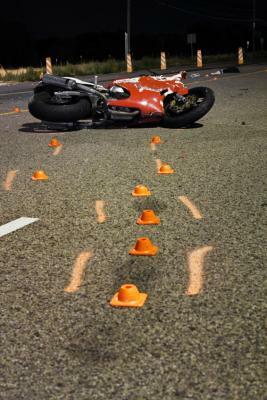 Turning in front of a motorcycle is a frequently cited caused of these crashes, and it usually has to do with the driver failing to see and recognize the approaching motorcycle, or misjudging the speed at which the motorcycle is traveling. Motorcycles require more skill to handle than other types of vehicles. Hazards in the road can pose a much greater threat to a two-wheeled bike. While some things – rock fall, debris blown into the road – are random acts of nature, in other instances the road itself may be dangerously designed. A curve may be too sharp for the posted speed limit, or there may be a lack of warning signs for such a curve. Things like these can cause a biker to lose control unexpectedly. A roadway architect or construction company may be at fault. There may be some defect in the design or manufacture of the motorcycle itself, or the motorcycle parts and components. When these defects are not known to the rider, the defects may cause a sudden and unexpected problem the rider is not properly prepared for. The result can be a serious crash. If you aren't sure of the exact factors that came together to cause a crash, don't worry. Our experienced attorneys will use our resources to determine if negligence played a role in the accident that injured you. If the accident can be traced back to someone else's carelessness, then you deserve the opportunity to hold the responsible party accountable in an accident claim. Motorcycles really don't offer any protection. Getting thrown from the bike can lead to fatal injuries, or life-altering injuries even if they don't prove fatal. Head and brain injuries are common, as are spine trauma and broken bones. Road burns are very common. If the crash was caused through no fault of your own, why should you have to deal with the consequences while the responsible party pays nothing? A wrongful death or injury claim handled by our experienced lawyers is your opportunity to hold them accountable. You deserve maximized compensation for your injuries, and the related expenses and losses. To find out if you have a claim, please call us at 833-546-3675 or contact us online. Our Florida attorneys proudly serve residents from across the state, and our office locations are in Fort Myers and Naples. As an injured motorcycle rider, you deserve to know if you have a claim. Your case review is free and involves no obligation. Our AV Preeminent® lawyers will provide the clear, straightforward answers you need.